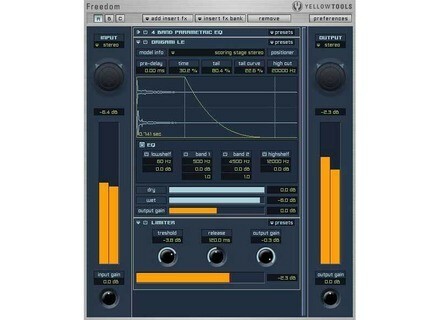 Freedom, Other effects bundle or multi-effect from Yellow Tools. 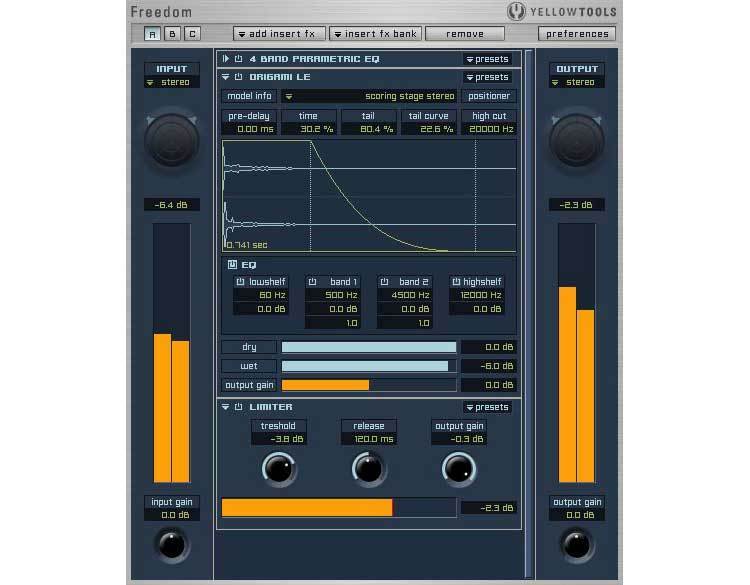 Yellow Tools has released version 2.5 updates for the virtual effect rack Freedom and the real-time impulse response processor Origami. Origami now contains the Élastique time-stretch technology (SOLOIST by zplane.development) for impulse response and audio files. This time-stretch function comes with the parameters pitch, tempo, formant preservation, sync and original tempo incl. "auto-scan" for the automatic recognition of the original tempo of audio loops. Furthermore the update contains new "step-arrows" for the preset menu in Origami that allow quicker switches of Origami presets, the "reverse" feature for impulse response files in Origami and a generally improved performance and impulse response engine. Freedom 2.5 of course includes the new Origami version and was additionally expanded with two new insert effects "Ring Modulator" and "Rotary Speaker". Both updates are free for registered users of these products, the Premium Suite or the Producer Suite and are available for download in the Yellow Tools User Area. JBridge v0.50 & J's MIDI Tools Update Version 0.63 of jBridge, the x86 to x64 VST bridge, has been released and the full version can now be purchased for the beta-phase price of €9.90. Knobster Plastic Piano [Freeware] Knobster has released Plastic Piano, a simple synthesizer / electric piano emulator. [Musikmesse] Novation SL Mk II Novation has launched the SL Mk II MIDI controller.